The Institute for Safe Medication Practices in the US has alerted consumers to use care when cleaning their contact lenses with any product they have not used before. People who wear contact lenses may assume that all multipurpose cleaning and disinfecting solutions used for rinsing and soaking lenses are the same. After all, they are stored side-by-side on supermarket and pharmacy shelves. However, these solutions are not all the same, and serious injuries can occur if they are used improperly. Figure 1. Clear Care® carton, bottle, and special contact lens case. Special lens holder is placed in plastic case with Clear Care® solution. Recently, a young woman who was staying at a friend's house noticed a bottle of contact lens solution in the bathroom. She removed her contacts, placed them in her flat contact lens case, and added the solution found in her friend's bathroom. 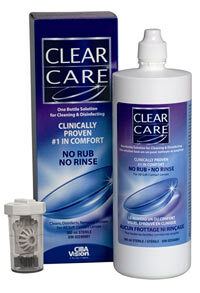 The solution was CLEAR CARE®, a lens cleaning and disinfecting product. To the woman, the product looked like any other contact lens cleaning solution. The label had a picture of a contact lens on it, and the bottle seemed to be the same shape and size as other contact lens solutions. The following morning, the woman put one of the contacts in her right eye and experienced excruciating pain and burning. The source of the problem was discovered when the woman called her eye doctor, mentioned the product she had used, and described how she had soaked her lenses with the solution in her flat contact lens holder. The doctor pointed out that Clear Care® is 3% hydrogen peroxide, which will cause severe burning if used directly in the eyes or as a soaking agent in typical, flat contact lens cases. Clear Care® comes with a special case that has a built-in neutralizer. A ring of platinum in the case reacts with hydrogen peroxide, causes effervescence and changes hydrogen peroxide into water. Only the special accompanying lens case can be used to neutralize the hydrogen peroxide. The process takes about 6 hours. After the disinfecting and neutralizing step is completed, the lenses can be removed from the case and safely placed in the eyes. Contact lenses must never be rinsed with the hydrogen peroxide solution and placed directly into the eye. The entire disinfecting and neutralizing step must be completed first. Not doing so can cause pain, burning, and chemical injuries to the eye, including tissue injuries. Other reports, similar to the one above, have occurred when patients confused Clear Care® or a generic hydrogen peroxide product with different cleaning and disinfecting solutions, including saline irrigating solutions. SafeMedicationUse.ca wants to inform consumers of the risks if contact lens solutions are not used properly, and offer the following advice. Do not assume all contact lens solutions are the same. Always read the instructions for use first, before removing your lenses. Follow the instructions carefully, step by step. Always use the lens case provided with the product. Take a few moments to make sure you know how to use your contact lens cleaning solution properly. It could save you from a very painful experience, or even eye damage.